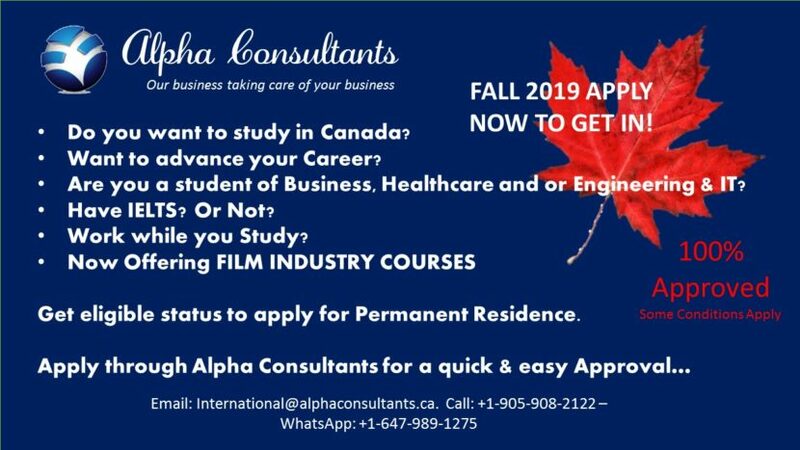 We are accepting application from international students for the programs in Business, IT, Healthcare, Finance, Hospitality, Trades and Film Industry. 16 years of Education is an asset. Guidance and processing of all your immigration needs. Our services to our clients doesn't end here, please see a detailed list of services on our website. And so many more programs. Kindly fill out the International Student Application below for the basic assessment for admission in Canadian schools, colleges or universities. We will contact you once the basic eligibility is met and further information or documents are required for admission. In this section, kindly enter the primary details of your profile Click here for application guide information package including supporting documents required to complete your application. CAD $ 6000 Minimum One Semester. By completing and submitting this Alpha Consultants application form, you will give consent for collection, use and disclosure to the relevant parties involved within the application process.